New Music Mondays! This weeks featured artists is Faded Paper Figures. Read below to learn more! 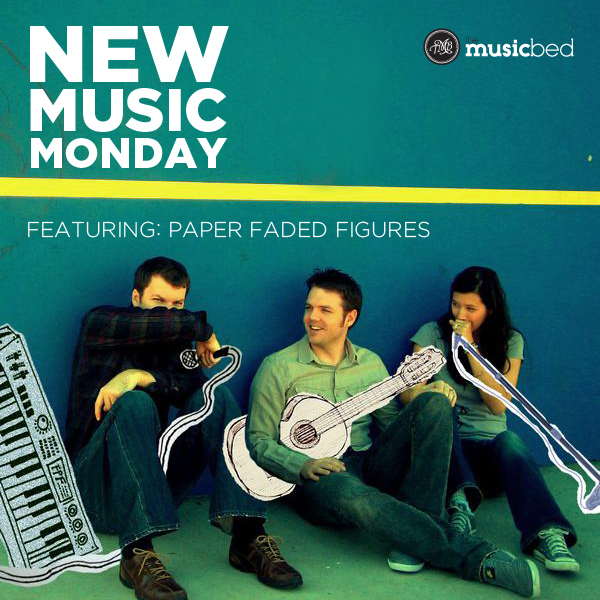 The Music Bed team has been working very hard to keep our library updated and fresh – so this week for New Music Monday we’re proud to offer Faded Paper Figures. The perfect blend of low-key pop and upbeat electronica fuse that would be great for a wedding highlight video, engagement or save the date video.&nbsp;They’ve been featured on Grey’s Anatomy, MTV’s&nbsp;Real World and My Life As Liz as well as numerous other indie films. And now they’re yours.&nbsp;Notable standouts are The Persuaded, North By North and You Know What I Mean. Take a listen. Fall in love. We know what you’re thinking: “These guys aren’t new.” True. But we’ve got some new tracks from this Fort Worth band from their new album Wait A Minute. Almost all of these new tracks are pretty little love songs that would compliment a number of projects. You asked, we answered. You wanted more instrumentals, we got more instrumentals. Not to be confused with the generic postrock/shoegaze that seems to be the norm these days, Last Lungs comes at you from a different angle with beautiful songs that build to awesome crescendos and climactic endings. Check out Inglend Part 3. With all the new music we add, sometimes it’s easy to forget some of the awesome originals we have. The CO is the perfect alternative pop/rock for wedding highlights or even church media/youth videos (think Heartbeat). Plus they just shot and released a video for their song Camo and it’s really cool. Another new artist on the site, Track A Tiger is almost a conundrum. Heart, a perfect song for a highlight video, is a pretty little acoustic alternative pop ballad compared to Light&nbsp; which is a pretty little folk/electronic/acoustic number. Not defined by any one genre, Track A Tiger brings beauty in a plethora of flavors. © 2011, The Music Bed, LLC, All rights reserved.